Featherland is the home of Michael and Lorraine Shelton. 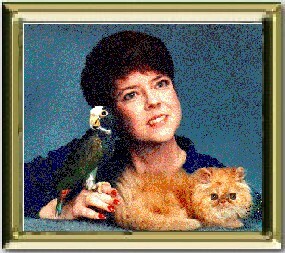 Lorraine is the one pictured above... the one without fur or feathers. Pictured is a red persian kitten from Featherland Cattery, CH Featherland's Rocket J. Cat. "Rocky" was my first show cat of my own breeding. After attaining his championship in both CFA and TICA in 1989, he went to his new home in the Netherlands. The bird pictured is a white-capped pionus parrot. "Flipper" is one of the breeding birds of Featherland Aviaries. Almost seven years ago, we brought our first puppy into our family, a Bernese Mountain Dog named Ebnet's Featherland Frangelica, or "Frankie" for short. She has been a wonderful pet. Please contact Lorraine with suggestions on improving this Web Page!